ABOUT US - UNITED INTERNATIONAL PHARMA CO., LTD.
United International Pharma (UIP) is a subsidiary of United Laboratories (Unilab) Group, which is one of the leading pharmaceutical companies in Southeast Asia and in the Indo-China region with a wide range of over 350 well-known pharmaceutical products from general medication, food supplements, personal, primary and chronic care, manufactured by 12 high-standard factories in Philippines, Indonesia, China, Thailand, Myanmar and Vietnam. 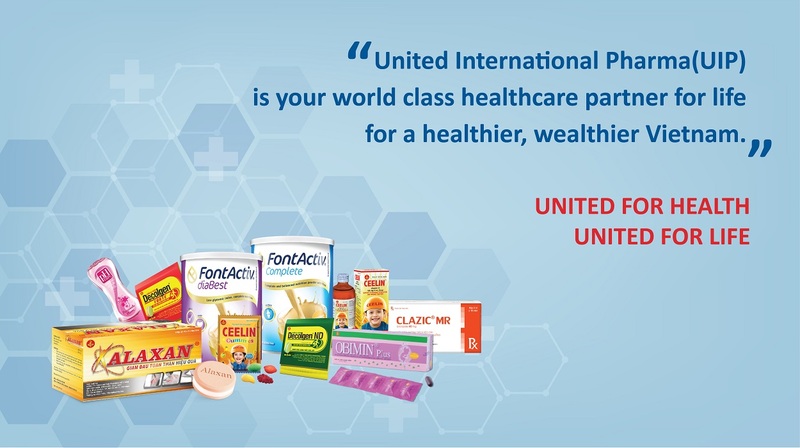 UIP - a 100% foreign-owned company - engaged in the manufacturing and promotions of pharmaceutical products in Vietnam since 1990, had the first factory established on 1997. UIP factory is one of the first to get WHO-GMP-GLP-GSP, ISO and OHSAS. As of today, the new GMP-PICS standardized factory located at VSIP II in Binh Duong province has made UIP become global standardized factory. We provide quality and affordable healthcare products and services that promote and enrich life for all communities that we serve by working together as one united family. We believe in succeeding through people in the spirit of “Bayanihan” that brings out the full potential of our people and partners, personally and professionally, resulting in a better quality of life for themselves, the company and the community.